It's been 25 years since Ghostbusters came out in theatres. If you still don't know how it ends, go watch it before reading this review. We'll wait. Everybody back? Good. Spoilers ahoy! The man responsible for the creation of the Stay Puft Marshmallow Man, Dr. Ray Stantz almost bit off more than he could chew when helping his fellow Ghostbusters take out the jolly giant. Now that's not fair. Ray didn't "create" Stay Puft - Gozer created it. She just told the boys to choose the form The Destroyer would take, and Ray tried to think of the most harmless thing he could. Remembering his boyhood summers at Camp Oconda, roasting marshmallows around the fire, he went for a pleasant, cheerful corporate icon, something harmless that could never, ever hurt anyone. Yeah, nice thinkin', Ray. Still, it's not like he personally summoned Mr. Stay Puft. 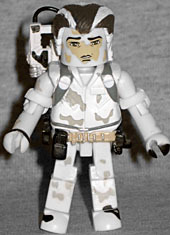 While Ray Stantz will be available in the second Ghostbusters Minimate box set, if that one is as hard to find as the first set, this Toys Я Us-exclusive two-pack may be the only chance you have to get him. To set this toy apart from the later version, he's, well, he's covered in goo. The package even calls him "Gooey Ray Stantz." When Stay Puft went kerblooey, everybody got drenched in molten marshmallow leavings. Thus, the figure is absolutely bathed in white paint apps. The sculpt is the same as the normal figure, with a fully sculpted uniform (and proton pack!) done as a separate piece that fits over the torso. So that's all the same - it's just white. In fact, it's molded in white, with the colors painted on. Ray was played by co-writer Dan Akroyd, who gave the character an earnest, childlike wonder (he bought a severely dilapidated building [without negotiation!] just because he liked the fire pole). 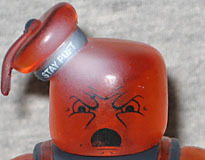 However, Dan Akroyd's head is fairly narrow - at least, it was in the '80s - so the Minimate's blocky noggin just doesn't convey the look of the character properly. The expression on his face is good, but the shape of the head is more suited to the animated Real Ghostbusters Ray than the live-action character. His hair has the appropriate swept-back style, but it seems to sit too low on his head. If you pull it up a few millimeters, the likeness actually improves. The "goo" paint on the hair is a lot better on the prototype photos, where it actually looks like goo: the final toy just looks like he's got hair stripes like Rogue used to. The proton pack has a removable gun, attached by a thin plastic tube so the figure can actually hold it; how fun is that! 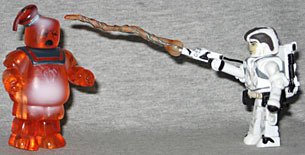 Not only that, but the set also comes with a translucent orange and blue proton stream that plugs onto the tip of the gun. Score! Even the mighty Stay Puft Marshmallow Man was no match for total protonic reversal! When the Ghostbusters crossed the streams of their proton packs, it resulted in thousands of pounds of melted Marshmallow goo! Ah, Mr. Stay Puft. That's his real name, you know. He's not actually "the Stay Puft Marshmallow Man," despite what popular culture would have you believe. Also, Humphrey Bogart never said "play it again, Sam," Darth Vader never said "Luke, I am your father," and no one ever in the history of Star Trek ever said "Beam me up, Scotty." Popcultural osmosis at its best - when the second-hand references overtake the original, something invariably gets lost. You may not think it to look at him, but Mr. Stay Puft really is built around a standard Minimate body: you just have to strip off a lot of unique sculpted pieces to get to it. 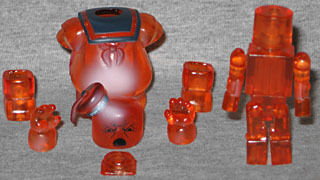 Basically, all you can see of that body when you look at the complete toy are his elbows. Everything else is an add-on. The "head" is really a big helmet with the hat molded onto it, the entire center mass is a single sleeve dropped over the body beneath, his hands/forearms are gloves and the feet/shins are really boots. The body is molded in clear plastic, then given a light coat of orange paint, so it'll remain translucent. Yes, just as the other figure was "Gooey Ray Stantz," this is "Exploding Stay Puft," seconds from going boom when the Ghostbusters finally did what they'd spent the entire movie saying must never be done: crossing the streams. Of course, they did it in Gozer's home dimension, not in ours, which is why only Stay-Puft was affected. 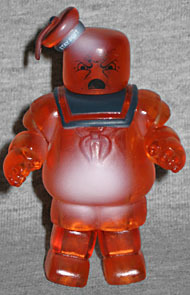 Just like the internal body, the outer Stay Puft shell is trans orange, but decorated with blue and red apps for his collar and hat (which also has small letters reading "STAY PUFT" on the band). Apparently thinking straight orange was too dull, AA has also put a few airbrushed spots of white on the forehead, stomach and lower back. When desiging Stay Puft, Art Asylum worked out a few different facial expressions, and this one gets the angriest version: you'd be angry, too, if every molecule in your body was exploding at the speed of light. The face details are just painted on, but anything else would be un-Minimately! His brow is furrowed, as much as such a thing is possible, his mouth is open in a bellow, and his eyes are focused downwards. Due to the limitations of the Minimate style, Mr. Stay Puft is only a bit over 3" tall. So yes, he's bigger than the other GB Minimates, but not big enough. He's about 100' tall - to be the "right" height for a Minimate, math tells us he'd need to be... a yard tall? Wow, maybe we'll be happy with the small height boost he got after all. Mr. Stay Puft is only one eleventh the size he'd need to be to be in a proper scale, but who would ever be able to afford that? There's a whole slew of exclusive Ghostbusters Minimates at TRU right now, but they seem to be selling fast. Ray may not come with a ghost you won't be able to get later, but Mr. Stay Puft is so cute, it'd be a shame to pass him up.